Posted on Wed, Jan 19, 2011 : 9:20 p.m. This was the Ann Arbor SPARK version of Gov. Rick Snyder. Snyder unveiled his economic development roadmap for the state of Michigan tonight during his first State of the State address. Gov. 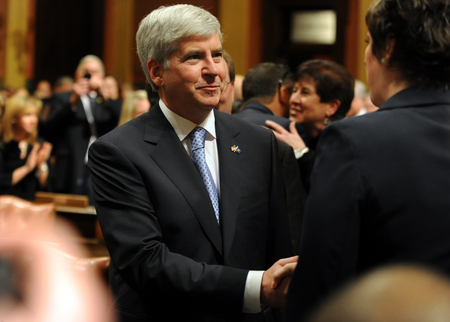 Rick Snyder, seen here greeting political leaders on his way to give the State of the State, proposed a reconfiguration of the state's economic development strategy. And the map leads right to the type of grassroots job-creating initiatives he favored when he co-founded SPARK in 2005 as an economic development engine for the Ann Arbor region and served as its chairman for four years. Snyder tonight outlined a wholesale reconfiguration of the Michigan Economic Development Corp., arguing that the agency needs to turn its focus toward micro-local efforts to boost the economy. That’s not to say Snyder, a Republican and first-time politician who took office Jan. 1, is spurning business tax reform and a promised battle to cut the cost of state employee compensation. But Snyder chose to use the intense spotlight of the State of State to declare that Michigan needs to abandon its strategy of “picking winners and losers” with expensive tax incentives. Instead, he wants the MEDC to partner with local economic development groups to boost existing businesses and entrepreneurs by establishing more business incubators, startup services, small-scale investment funds and job posting services. The model of grassroot services looks a lot like what Snyder helped develop as co-founder and chairman of Ann Arbor SPARK, whose first CEO, Michael Finney, is now leading the MEDC. Michael Finney, CEO of the Michigan Economic Development Corp., speaks after Gov. Rick Snyder's State of the State address. Throughout his gubernatorial campaign, Snyder derided the MEDC’s strategy of distributing costly tax incentives to convince outside companies to announce expansions in Michigan. Those announcements typically came with a promise to add a specific number of jobs - promises those companies often failed to uphold. Even tech giant Google, for example, which received state tax incentives in 2006, has failed to meet its promise of adding 1,000 jobs in downtown Ann Arbor by 2011. The company now has about 250 employees here. During his campaign, Snyder regularly criticized the “press release” strategy of announcing company expansions induced with tax incentives. To create sustainable jobs, he argued, Michigan needs to engage local economic development groups like SPARK, Grand Rapids-based The Right Place and Detroit-based TechTown to help entrepreneurs get a headstart and give a helping hand to existing mid-size businesses. Finney said in an interview that those organizations will be asked to extend their economic development reach to surrounding communities to help boost the economy. Finney has hired Amy Cell, previously SPARK’s vice president for talent enhancement, to lead a statewide initiative designed to help talented employees connect with hiring companies. The initiative, which Snyder trumpeted during the State of the State, will involve the creation of a statewide job openings database. Helping companies find talented workers - an economic development concept formed and executed at SPARK by Snyder, Finney and Cell - is a quick way to find companies that are growing and need assistance from the MEDC, Finney said. “We could end up identifying literally thousands of companies that are in a growth mode where we can, in fact, assist those companies through economic gardening, entrepreneurial resources or, in fact, attracting them to our state from other locations,” Finney said. Among the other initiatives MEDC is expected to roll out are an effort to attract people with Michigan ties who have left the state to return to Michigan, and an initiative to retrain big-company employees to work for small businesses. Grassroots economic development resources don't generate press releases. They require sweat equity. "True success is based on achieving real results for real people," he said. "Let’s roll up our shirtsleeves and get to work." Sun, Jan 23, 2011 : 12:03 a.m.
Public employees, at compensation levels approximately twice their non public peers, are the ones 'making out' very nicely. Thu, Jan 20, 2011 : 8:55 p.m.
&quot;Like that trillion dollar stimulus bill ? How is that working out for you?&quot; Can you stick to the facts? 1. It wasn't a trillion dollars. 2. It included hundreds of millions in tax cuts that conservatives claim stimulate the economy. 3. Corporations are banking record profits so clearly someone is making out in this economy. Thu, Jan 20, 2011 : 4:35 p.m.
Thu, Jan 20, 2011 : 3:43 p.m.
To Veracity: Like that trillion dollar stimulus bill ? How is that working out for you? Seriously, you would do well to study your history as well as economics. Even the FDR administration admitted the works programs did little to improve the unemployment situation. The economic principle behind that is simple enough. You can't take money out of the economy from one group of people through taxation or borrowing and give it to another group through &quot;make work&quot; projects and expect growth to occur. I don't blame FDR for helping people through tough times, but we already have that today - it's called unemployment insurance. 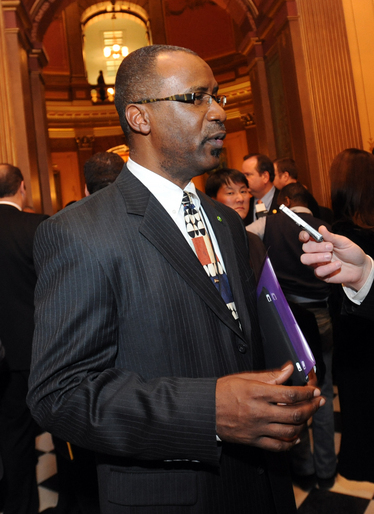 Thu, Jan 20, 2011 : 3:16 p.m.
&quot;I like the small business tax reform ideas as well. I don't mind paying my fair share but when I look at the MBT form and see all the special exemptions it makes my blood boil. Everyone should pay a simple and fair and small-as-possible tax.&quot; How do you think those got into the MBT? Democrats and Republicans alike pushed those into the law to benefit their various contributors. Your finger-pointing at the former Governor on that point is misplaced. Thu, Jan 20, 2011 : 1:34 p.m. Governor Snyder should not be over-enthused about expanding the MEDC effort. In the past ten years, MEDC produced only about 4000 jobs which were mostly high tech requiring specialized education. While castigating tax incentives the Governor forgets that the movie industry brought to Michigan's economy several times the millions of dollars that it received. Furthermore, reducing business tax will allow more profits to be retained but will not generate new jobs. Only increased demand for products and services will cause job creation. A company must anticipate that a new employee will generate revenues which will exceed the cost of his employment. Otherwise the company's profits will decline and profit is the primary motivator for every business. The only way to quickly employee the over 600,000 jobless in Michigan is to create work for which they have experience or can be quickly trained. Employment of the masses can be accomplished through infrastructure jobs but will require billions more dollars from the federal government, like the CCC effort begun in 1933 by FDR. The expense will be repaid in time. Meanwhile, matching jobs available with the unemployed via a coordinated state-wide jobs computer bank may be helpful. Thu, Jan 20, 2011 : 1:29 p.m.
As a person with ties to Michigan who has just moved back to the state, and as a progressive Democrat, I like much of what I heard Snyder say about job growth. Given the dire straits we are in and given the fact that the governor isn't going to rely on the same old, unfruitful plans to boost the state's economy and jobs, how about if we table our cynicism and give Snyder's plans a chance. I didn't vote for him, but I'm willing to support new approaches, no matter who is behind them. Thu, Jan 20, 2011 : 1:26 p.m. I liked the &quot;gardening&quot; vs &quot; hunting&quot; analogy the Governor made in speaking about businesses . The previous governor was a lousy shot and suffered many misfires. She will be more welcome in the kitchen cooking vegatables and leaving the jobs issue in more capable hands. Like many small business men and women, it was befuddling to me why the previous administration gave away the store in an attempt to bring in businesses while sticking it to the ones already here. I like the small business tax reform ideas as well. I don't mind paying my fair share but when I look at the MBT form and see all the special exemptions it makes my blood boil. Everyone should pay a simple and fair and small-as-possible tax. Create a good environment for businesses and they will thrive and provide the needed jobs. Thu, Jan 20, 2011 : 2:32 p.m. This and the thought of when he had his opening gubernatorial speech on inauguration day. He stated this is not going to be an easy elevator ride to the top. Our child said it sounds more like a ride at Disney if it isn't going to be fun. I wish this new governor luck. He is going to need it after the mess Granholm made. Thu, Jan 20, 2011 : 12:58 p.m.
Michigan unemployment still top three in the country. . <a href="http://cr4re.com/charts/charts.html?Employment#category=Employment&chart=StateUnemployNov2010.jpg" rel='nofollow'>http://cr4re.com/charts/charts.html?Employment#category=Employment&amp;chart=StateUnemployNov2010.jpg</a> . Apparently, total Employment across the nation is only at 58% - lowest in two decades. And +42 million Americans are on Food Stamps - highest ever. New Jobs are being repressed somehow - - too expensive to create. Thu, Jan 20, 2011 : 4:45 a.m. Does anyone know where I can watch the address online? thank you! Thu, Jan 20, 2011 : 2:35 p.m.
Thu, Jan 20, 2011 : 4:31 a.m.
Hmmmm.. we'll give the bridge to Canada costing us 10,000 more high paying jobs and helping an already booming Canadian economy. And we'll give our remaining jobs to immigrants. Yeah..... sounds like a..... plan. Thu, Jan 20, 2011 : 4:25 a.m. It all sounds good until you start taking away the tax breaks that all of the various business sectors have managed to weasel for themselves from the Legislature over the years. Already the Manufacturers are complaining about how much they pay in taxes, even after getting big tax breaks under the MBT.